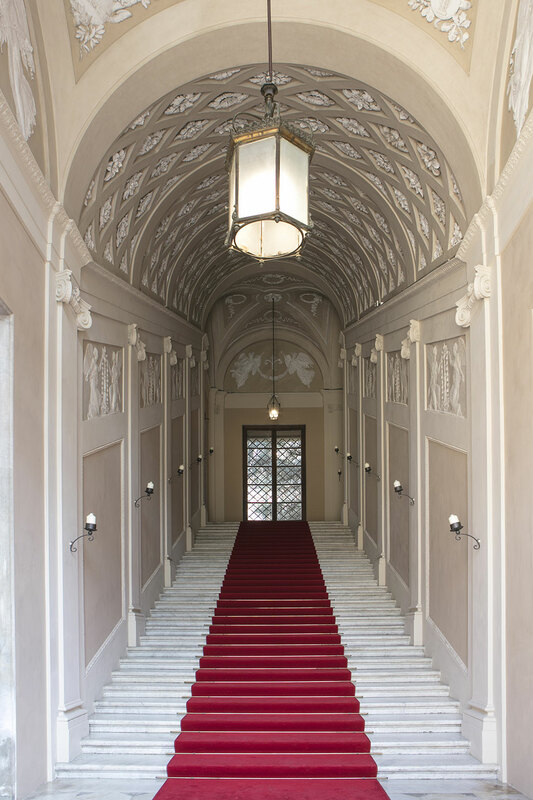 Maria Luisa Borbone commissioned Lorenzo Nottolini in 1818 to design the Royal Staircase in order to replace the earlier sixteenth-century staircase, considered too long and tiring. The entrance was moved from the fourth arch in front of the fifth arch. The first flight was built next to the wall of the Carriage Entrance. Documents show that the 83 marble stairs were quarried in Carrara between December 1818 and the beginning of 1819. The staircase should highlight the celebration function of the redecorated Throne Quarter apartments. 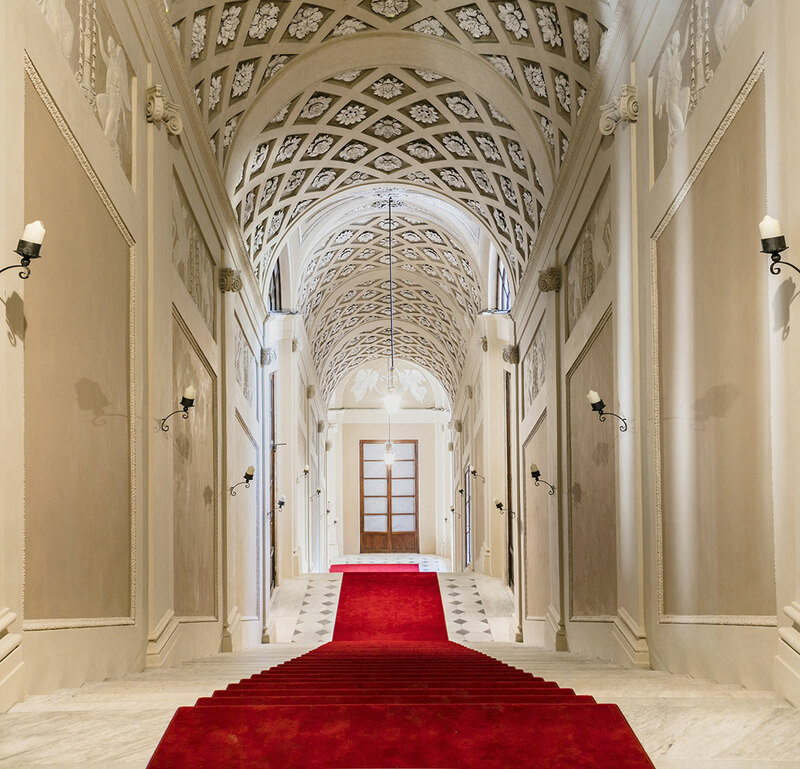 The staircase presents features of austere simplicity and is divided into three flights with a barrel vaulted ceiling with sunken panels. 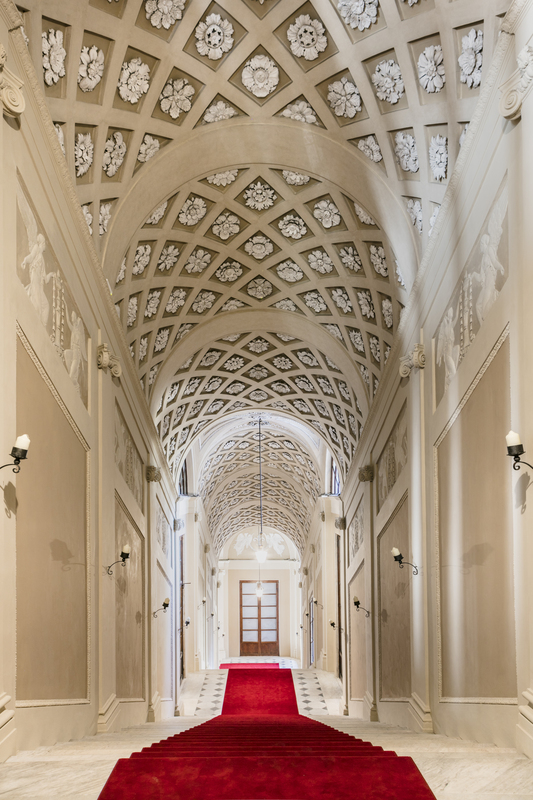 The ascent is rhythmically accompanied by Ionic pilaster strips with inserted mirrors and stucco bas-reliefs. The relief decoration, designed by Nottolini and commissioned to the sculptors Guidotti and Paoli, was planned as a grand iconographic series reduced during its completion to a unique dual thematic concept: victory wings and griffins with the heraldic symbols of the Borbone family, the Castile Tower and the Lily of France.